Unfortunately our full catalog may not be displayed in your state. If you contact our Customer Support by one of the methods below, we will be able to assist you in locating the product you are looking for. As a VIPPS accredited pharmacy licensed and/or authorized in all 50 states, pharmacy regulation requires us to ask for your shipping zip code. Please use numbers only in this field. WARNING: You`ve selected a custom quantity of . This means you only want dispensed. Are you sure you only want to order ? If you need assistance, let one of our customer service representatives help you: 1-800-748-7001. This product requires a valid prescription for shipment, please note that HealthWarehouse.com may not accept prescriptions faxed or emailed by patients. IMPORTANT: HOW TO USE THIS INFORMATION: This is a summary and does NOT have all possible information about this product. This information does not assure that this product is safe, effective, or appropriate for you. This information is not individual medical advice and does not substitute for the advice of your health care professional. Always ask your health care professional for complete information about this product and your specific health needs. USES: This medication is used to treat high levels of prolactin hormone in your body. High levels of prolactin in women can cause symptoms such as unwanted breast milk and missed periods and can cause difficulty becoming pregnant. High levels of prolactin in men can cause symptoms such as enlarged breasts and decreased sexual ability/desire. 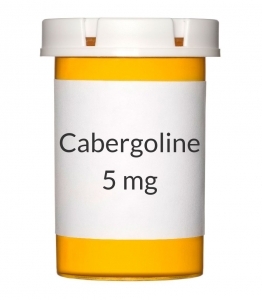 Cabergoline is an ergot medication and works by blocking the release of prolactin from the pituitary gland. HOW TO USE: Take this medication by mouth with or without food, usually twice a week or as directed by your doctor. The dosage is based on your medical condition and response to treatment (prolactin levels). Your doctor will start you at a low dose and slowly increase your dose over several months to help decrease side effects. Follow your doctor's instructions carefully. Take this medication regularly to get the most benefit from it. To help you remember, mark the days on the calendar when you need to take the medication. Tell your doctor if your condition persists or worsens. SIDE EFFECTS: Nausea, vomiting, stomach upset, constipation, dizziness, lightheadedness, or tiredness may occur. If any of these effects persist or worsen, tell your doctor or pharmacist promptly. Remember that your doctor has prescribed this medication because he or she has judged that the benefit to you is greater than the risk of side effects. Many people using this medication do not have serious side effects. Tell your doctor immediately if any of these rare but serious side effects occur: shortness of breath, persistent cough, swelling ankles/feet, unusual tiredness, mental/mood changes (such as nervousness, compulsive behavior including urge to gamble), vision changes, painful menses, breast pain. Get medical help right away if you have any serious side effects, including: chest pain, lower back/flank pain, change in the amount of urine. A very serious allergic reaction to this drug is rare. However, seek immediate medical attention if you notice any symptoms of a serious allergic reaction, including: rash, itching/swelling (especially of the face/tongue/throat), severe dizziness, trouble breathing. This is not a complete list of possible side effects. If you notice other effects not listed above, contact your doctor or pharmacist. In the US - Call your doctor for medical advice about side effects. You may report side effects to FDA at 1-800-FDA-1088. In Canada - Call your doctor for medical advice about side effects. You may report side effects to Health Canada at 1-866-234-2345. PRECAUTIONS: Before taking cabergoline, tell your doctor or pharmacist if you are allergic to it; or to other ergot medications (such as ergotamine); or if you have any other allergies. This product may contain inactive ingredients, which can cause allergic reactions or other problems. Talk to your pharmacist for more details. Before using this medication, tell your doctor or pharmacist your medical history, especially of: liver disease, high blood pressure (hypertension), heart valve disease, abnormal scarring/thickening of the lining in the lungs/heart/behind the abdomen (pulmonary/pericardial/retroperitoneal fibrosis). This drug may make you dizzy. Do not drive, use machinery, or do any activity that requires alertness until you are sure you can perform such activities safely. Limit alcoholic beverages. To reduce the risk of dizziness and lightheadedness, get up slowly when rising from a sitting or lying position. Before having surgery, tell your doctor or dentist about all the products you use (including prescription drugs, nonprescription drugs, and herbal products). During pregnancy, this medication should be used only when clearly needed. Discuss the risks and benefits with your doctor. It is unknown if this medication passes into breast milk. However, this medication may affect breast milk production. Therefore, breast-feeding while using this drug is not recommended. Consult your doctor before breast-feeding. DRUG INTERACTIONS: Drug interactions may change how your medications work or increase your risk for serious side effects. This document does not contain all possible drug interactions. Keep a list of all the products you use (including prescription/nonprescription drugs and herbal products) and share it with your doctor and pharmacist. Do not start, stop, or change the dosage of any medicines without your doctor's approval. Some products that may interact with this drug include: antipsychotic medications (such as chlorpromazine, haloperidol, thiothixene), metoclopramide, prochlorperazine. OVERDOSE: If overdose is suspected, contact a poison control center or emergency room immediately. US residents can call the US National Poison Hotline at 1-800-222-1222. Canada residents can call a provincial poison control center. Symptoms of overdose may include severe dizziness, fainting, mental/mood changes (such as hallucinations). NOTES: Do not share this medication with others. Laboratory and/or medical tests (such as prolactin levels, EKG) should be performed before starting and while you are taking this medication to monitor your progress or check for side effects. Consult your doctor for more details. MISSED DOSE: If you miss a dose, take it as soon as you remember. If it is near the time of the next dose, skip the missed dose and resume your usual dosing schedule. Do not double the dose to catch up. STORAGE: Store at room temperature between 68-77 degrees F (20-25 degrees C) away from light and moisture. Do not store in the bathroom. Keep all medicines away from children and pets. Do not flush medications down the toilet or pour them into a drain unless instructed to do so. Properly discard this product when it is expired or no longer needed. Consult your pharmacist or local waste disposal company for more details about how to safely discard your product. Information last revised August 2012. Copyright(c) 2012 First Databank, Inc.
As seen on NBC Nightly News, we are the accredited, VIPPS-certified online pharmacy with the lowest prices on prescription drugs. You'll never have to wait around at the pharmacy again - we deliver your medications right to your door. 5 minutes of setup today will save you hours and dollars exponentially over time. Ask your doctor for a 90-day supply and then choose AutoReorder to save even more. HealthWarehouse.com is a VIPPS accredited pharmacy based in Florence, Kentucky. We're licensed and/or authorized to sell prescriptions in all 50 states and the District of Columbia and have become America’s Trusted Online Pharmacy since 2008. For more information about how we’re revolutionizing pharmacy, one prescription at a time, click here.